A record-shattering decline in Bering Sea ice this winter and spring has threatened the very way of life in Alaska's coastal villages, where people rely on ice cover for navigation and hunting. "Fellow Americans are suffering from a natural disaster," says a climate scientist. In the middle of February, one-third of the ice covering the Bering Sea off Alaska’s West Coast vanished within a week when an enormous pulse of heat swept over the Arctic. Scientists were stunned. This rapid meltdown precipitated a record-shattering decline in Bering Sea ice through the winter and into spring, which has threatened the very way of life in Alaska’s coastal villages — reliant on the ice cover for navigation and hunting. February and March ice levels were as low as far back as scientists can reconstruct, dating back more than 160 years. 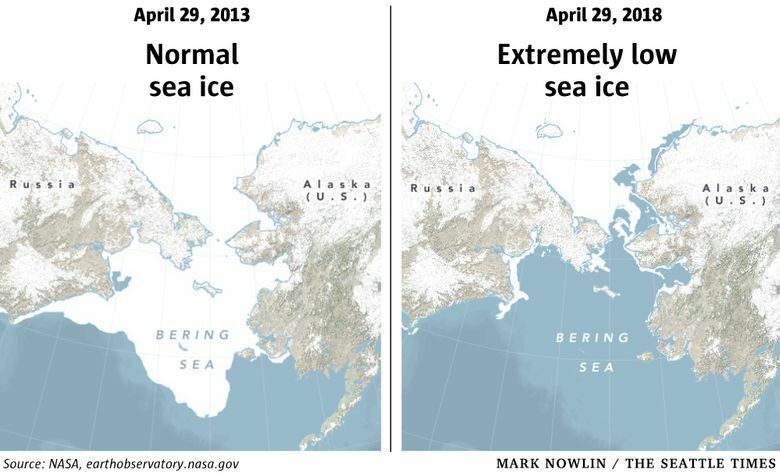 Now, the ice is almost entirely gone — just 10 percent of normal levels as of the end of April. “We’ve fallen off a cliff: very little sea ice remains in the Bering Sea,” tweeted Rick Thoman, an Alaska-based climatologist with the National Oceanic and Atmospheric Administration, on April 29. Thoman said that the ice disappeared this year four weeks earlier than in any other year except 2017, when its extent was also well below normal. The ice extent over the Chukchi Sea, just north of the Bering Sea abutting Alaska’s northwest coast, is also abnormally depleted. It recently began its melt season earlier than ever before measured. The ice loss has real consequences for the people in the region, say scientists. “The low sea ice is already impacting the lives and livelihoods of people in Western Alaska coastal communities by restricting hunting and fishing which are the mainstays of the economies of these communities,” Thoman said in interview. “Without the ice, it’s very difficult, if not impossible, to put food on the table,” added Brian Brettscheider, a climate scientist with the International Arctic Research Center at the University of Alaska Fairbanks. In April, this research center released a report, detailing the myriad effects of the low ice. Perhaps, most significantly, the lack of ice severely restricted travel in the region. The lack of ice also exposed vulnerable infrastructure directly to the elements. In late February, when a storm slammed into Little Diomede Island, some waterfront homes and buildings crumbled as towering waves battered the shore. Scientists say no one thing caused the ice to melt so far so fast, but rather a convergence of many different factors, connected to long-term climate change and this year’s weather pattern. To begin, temperatures in the Arctic have warmed for decades, more than anywhere else on the planet, and sea ice levels are trending sharply downward. “[T]he warmed state of the Arctic has primed the region for low ice values,” said Brettscheider. Both ocean and air temperatures were well above normal in the region leading up to and during the meltdown. Meanwhile, air currents over the Arctic guided storms through the Bering Sea from south to north repeatedly, often drawing abnormally mild air from tropics and mid-latitudes into the region. This year’s extremely low sea ice in the Bering Sea is just one of many indicators of abnormally warm conditions in the Arctic over the past several winters. In four of the past five, massive plumes of heat have swelled over the Arctic all the way to the North Pole. Such events were highly uncommon in the past. “I think it is particularly noteworthy and alarming to see all of the recent Arctic extremes now during the wintertime, whereas previously they were more confined to the summer and fall,” Labe said. Thoman, Labe and Brettscheider further stressed that what happens in the Arctic doesn’t stay in the Arctic. “The Arctic is part of the interconnected Earth system, and its changes will certainly have far-reaching effects,” Labe said.